Inadvertent intra-arterial injection of a drug meant to be given by intravenous (i.v.) route, either iatrogenic or self-administered, is a potentially serious complication. It is associated with considerable morbidity. Such accidental injections can result in minor sequelae or devastating complications. The spectrum of manifestations ranges from pain on injection, numbness, weakness, paresthesias, and motor deficit to swelling, limb ischemia, skin necrosis, contractures, gangrene, or autoamputation. Various agents such as diazepam, midazolam, promethazine, pentazocine, and thiopentone and antibiotics such as penicillin, phenytoin, ketamine, propofol, atracurium, and tubocurarine have been reported to cause ischemic injuries on intra-arterial injection. 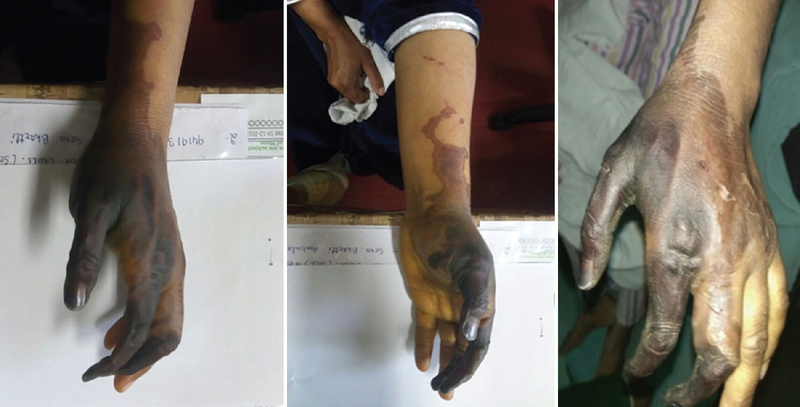 Gangrenous changes in skin due to accidental intra-arterial injection of promethazine and pentazocine, have been reported. Accidental intra-arterial injection is most commonly encountered in the antecubital fossa. However, the recent reports although exist for such adverse drug experiences (ADEs) in the radial and ulnar arteries are relatively less in number. We hereby report a serious, preventable ADE in the form of digital gangrene induced by inadvertent intra-arterial cocktail injection of anesthetic agents such as promethazine, pentazocine, and atropine, which seems to be in the radial artery as the lateral three digits and dorsum of the hand are affected. A middle aged normotensive and nondiabetic female underwent tubal ligation on January 1, 2018, at a district hospital. For the surgery, she was given a cocktail anesthesia of injection pentazocine 30 mg, injection atropine 0.4 mg, and injection promethazine 25 mg, all of which were inadvertently administered intra-arterially in the left hand by a faulty technique, which were meant to be given by i.v. route. This was followed by pain, swelling, and start of bluish discoloration of the lateral three fingers of the left hand 2 days after the administration. Furthermore, there was a history of fever. She was referred to the Department of CVTS, SSH, GMC, Jammu, for further management. On day 4 posttubal ligation, examination of the left hand showed bluish discoloration of the thumb, index, and middle fingers [Figure 1]. The pulsations of the radial artery were not palpable whereas those of ulnar artery were palpable. On color Doppler, there was no evidence of any flow in the left radial artery at the wrist region. Furthermore, no significant flow was noticed in the deep palmar arch in the left hand. There was no prior history of any pain or bluish discoloration of fingers, diabetes mellitus, atherosclerosis, peripheral vascular disease, thoracic outlet syndrome, collagen vascular disease, or any hypercoagulable state. She was prescribed injection alprostadil 500 μg once daily, injection low-molecular-weight heparin 0.6 ml subcutaneously twice daily, tablet aspirin 75 mg + clopidogrel 75 mg + rosuvastatin 10 mg once daily, and tablet nifedipine retard 10 mg twice daily. On day 8 postligation, gangrenous changes along with contracture of the lateral three digits of the left hand were observed [Figure 1]. Radial pulsation was absent in the left hand. Furthermore, sensations were lost on the dorsal aspect of the affected three digits. All the routine investigations were done which were as follows: hemoglobin – 9 g/dl, total leukocyte count – 12000/cumm, platelet count – 1.7 lakhs/cumm, blood sugar – 65 g/dl, blood urea – 31 mg/dl, serum creatinine – 0.7 mg/dl, serum bilirubin – 0.4 mg/dl, serum glutamic oxaloacetic transaminase – 98 mIU/ml, serum glutamic pyruvic transaminase – 58 mIU/ml, PTI – 85.7%. Electrocardiography and chest X-ray were within normal limits. The patient was taken up for reparative procedure on day 17 postligation. Under general anesthesia, ray amputation of the index finger and amputation of the middle finger at proximal interphalangeal joint was done. Debridement of the gangrenous area and wire fixation of the thumb at the metacarpophalangeal joint was done. It was followed by amputation of the thumb [Figure 2]. Postoperative antibiotics and analgesics were given. The current ADE could not be explained by a concurrent disease, drug, or chemicals other than the drugs in combination in this case. The rechallenge and dechallenge could not be ascertained due to ethical issues involved. Furthermore, the reaction was of serious nature as it warranted prolonged hospital stay and has caused disability in the form of contractures and required intervention to prevent permanent deformity as per the Hartwig ADR Severity Assessment Scale. It was also preventable as per the Schumock and Thornton preventability Scale. As per the Pharmacovigilance Programme of India (PvPI) norms, the said case was reported within 24 h to the National Coordination Centre–PvPI. The causality of ADE was “possible” as per causality assessment with the standard Naranjo and the WHO Uppsala Monitoring Centre scale. The ADE was not studied for dose-dependent response and seemed to be predictable. However, the type of ADE cannot be commented upon. In the past, accidental intra-arterial injection was most commonly encountered in the antecubital fossa. However, recent reports in the radial and ulnar arteries have also been encountered. In our case, it seems to be in the radial artery as the lateral three digits and dorsum of the hand are affected. In another similar case report, ulnar artery was involved in which the thumb was spared. In such cases, pain and tenderness at the site of injection are the foremost symptoms which were also reported by our patient. Various mechanisms have been proposed to explain the pathophysiology of tissue ischemia in these cases. Norepinephrine-mediated vasoconstriction, endothelial inflammation, direct cytotoxicity, and high osmolarity and lipid solubility of the injected drug may lead to the wide spectrum of ischemic manifestations. The temporal relationship of the adverse event with intra-arterial administration of the three drugs and the absence of any concomitant drug administration or a history of disease, which could have led to the event, suggest that they are the suspected drugs. Similar findings of gangrenous changes in skin due to accidental intra-arterial promethazine have been reported. It is highly corrosive to the intima of blood vessels and can cause pain, redness, swelling, and severe vasospasm or nerve damage on inadvertent intra-arterial injection, leading to disastrous complications. However, no untoward immediate or delayed vascular complications have been reported with intra-arterial administration of atropine. Furthermore, the reaction was of serious nature as it prolonged the hospital stay, was likely to cause disability, and required intervention to prevent permanent deformity as per the Hartwig ADR Severity Assessment Scale. It was also preventable as per the Schumock and Thornton Preventability Scale. Thus, the gangrenous skin changes in our case could be attributed to promethazine or pentazocine. However, the role of atropine in the same cannot be ruled out. It is pertinent to mention that extreme caution should be exercised while making the parenteral use of these drugs. Furthermore, proper and careful localization of the vessel of administration is imperative to avoid such serious adverse events. Fikkers BG, Wuis EW, Wijnen MH, Scheffer GJ. Intraarterial injection of anesthetic drugs. Anesth Analg 2006;103:792-4. Dasgupta M, Adhikari S, Datta M. Inadvertent intraarterial injection leading to gangrene: A rare but devastating postoperative complication. J Obstet Gynaecol India 2012;62:56-8. Lindell TD, Porter JM, Langston C. Intra-arterial injections of oral medications. A complication of drug addiction. N Engl J Med 1972;287:1132-3. Lloyd WK, Porter JM, Lindell TD, Rosch J, Dotter CT. Accidental intraarterial injection in drug abuse. Am J Roentgenol Radium Ther Nucl Med 1973;117:892-5. Engler HS, Purvis JG, Kanavage CV, Ogden LL, Freeman LA, Moretz WH. Gangrenous extremities and intra-arterial injections. JAMA 1967;200:788.